When you install wordpress you automatically get feed or rss setup at url /feed/ (or /rss/). It seems to be a good option to continue with this approach but its hard to get subscribers stats from it. There are couple of wordpress plugins which generates some basic stats. But I found it more appealing to use some external feed service. 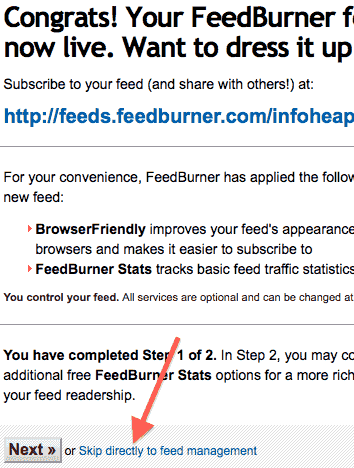 Even though Google reader and Google feedburner have nothing in common, but both are related to RSS. So I mentioned this. visit My feeds on Google feedburner site. In the box next to “blog or feed address” type your feed address. e.g. for infoheap.com type infoheap.com/feed/ assuming your wordpress is installed at root location. The feed address should have a unique id. If it is not unique, you will be asked to pick another id. Make sure you pick an id which looks similar to your sitename. This can be changed later, but its not a good idea to change it once you have subscribers using this adderess. 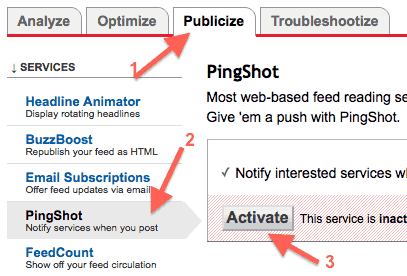 This will activate ping services which notify other services whenever a post is added. PingShot is a quick notification service that enables your feed to be updated in the widest variety of places as quickly as you add new content. You can get more info about pingshot at Google feedburner pingshot faq page. 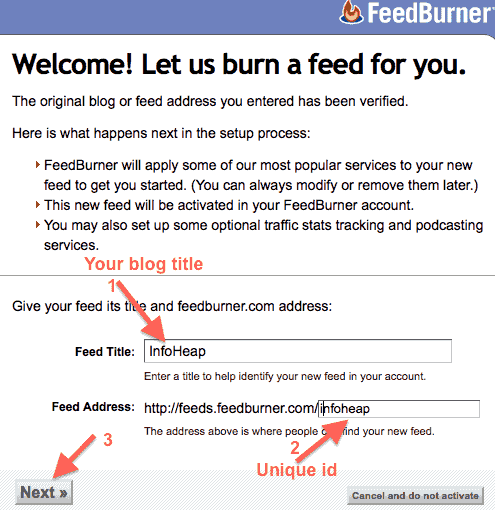 Now http://feeds.feedburner.com/FEEDID (replace FEEDID with whatever is you selected above) is set to be the feed url. This is good enough for a start and if you wish you can explore other customization options in Feedburner UI. Please note that this article is meant for wordpress blog site but can it can also be used for non-wordpress site as well as long as we have an RSS url available on that site.